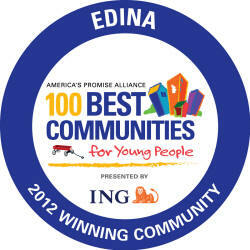 The selection of Edina as one of the 100 Best Communities for Young People in America in 2010, 2011, and 2012 is both a result of good work in our community and also a challenge to build on that status. The recognition was by America's Promise Alliance, a nationwide partnership organization dedicated to youth and children, and its newsletter announcing the selection noted that the youth poverty rate in Edina is just 2.5 percent, based on an annual family income of $21,200 or less. With a total population of just under 48,000, and some 24 percent, or 11,500, of those being under 18, a 2.5 percent poverty rate would translate to just about 275 young people. If we broaden our concern to include students who qualify for the free and reduced lunch program in Edina Public Schools, the number of youth in need increases to about 640. (That eligibility is based on a household income of less than $42,643 for a family of four, which is 185 percent of the Federal Poverty Guideline of $20,050.) Thus, we have a very tangible challenge and opportunity to make a difference in the quality of life for these members of our community. The Edina Community Foundation proposes that we commit ourselves to an Edina Challenge: A collaboration of many of our community organizations and grant-makers in order to maximize our collective effectiveness in enabling participation of youth in poverty in the community, educational, and recreational programs that lead to success in adult life. This mission will be pursued with efforts to increase funding for existing and new programs that support these individuals. Edina Community Education offers youth scholarship aid for its public sessions and for School Readiness programs. The Edina Resource Center provides assistance to people seeking information and resources for family and youth services. Oasis for Youth serves homeless youth with counseling, emergency shelter and longer-term housing. Southdale YMCA offers substantial financial aid in its many youth and teen programs, including after school and leadership activities, summer camps and service learning. Volunteers Enlisted to Assist People (VEAP) serves the Edina community through its Bloomington office with a food shelf, social services, transportation services and several programs focused on youth: a summer youth food program, Birthday Bags, Back to School Bag and Holiday Toy Program. Grant-in-Aid program administered by the Edina Parks & Recreation Department. Summer of Opportunity program administered by the Edina Resource Center to allow low-income middle school youth in Edina Public Schools to attend a YMCA summer camp. Oasis for Youth, a new organization formed to serve homeless and precariously housed youth in Edina and southern Hennepin County. Warm Hands, Warm Heads, Warm Hearts program of the local Rotary District (and also supported by Edinaâ€™s two Rotary clubs) to provide mittens and hats to needy children during the holiday season. The next phase of this Edina Challenge initiative will be for these groups to come together in the near future and share information about their programs and grantmaking efforts related to our goal of enhancing the lives of the 640 children in need in our community. Representatives of these groups have initially reacted positively to this proposal, with all expressing interest in further participation. Interest and support has also been expressed by representatives of the City of Edina and Edinaâ€™s Public Schools, Chamber of Commerce, Rotary Clubs, Normandale Lutheran Church and the Edina Education Fund.